If you don't see fade times available for a cue, it means there is no values changing from the previous cue. 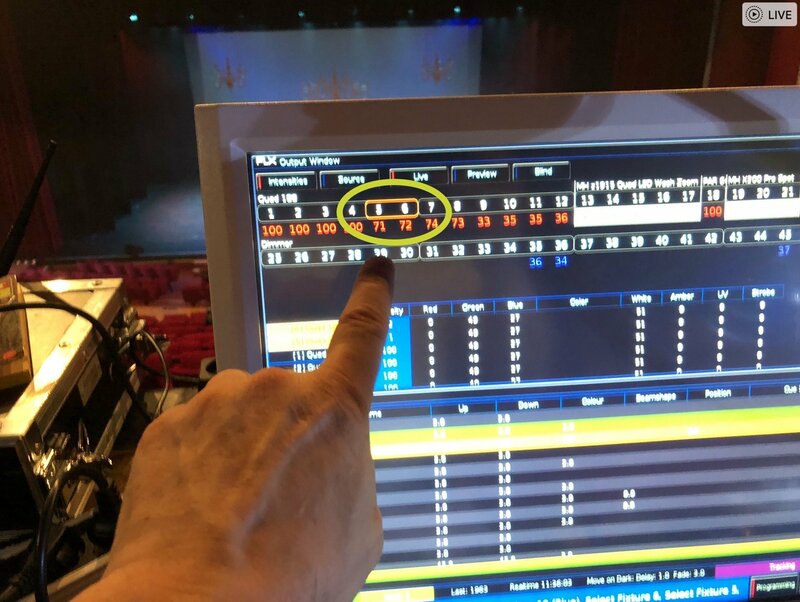 For example if in cue 1 you have recorded your fixtures at 100%, and you then tap record to save cue 2, you won't see any fade times, as cue 1 is identical to cue 2. Regarding fixtures selecting, do you still see the issue happening if you tap SETUP -> System Settings -> Auto Select Channel on Fader movement -> Disabled? Let me know how you get on. 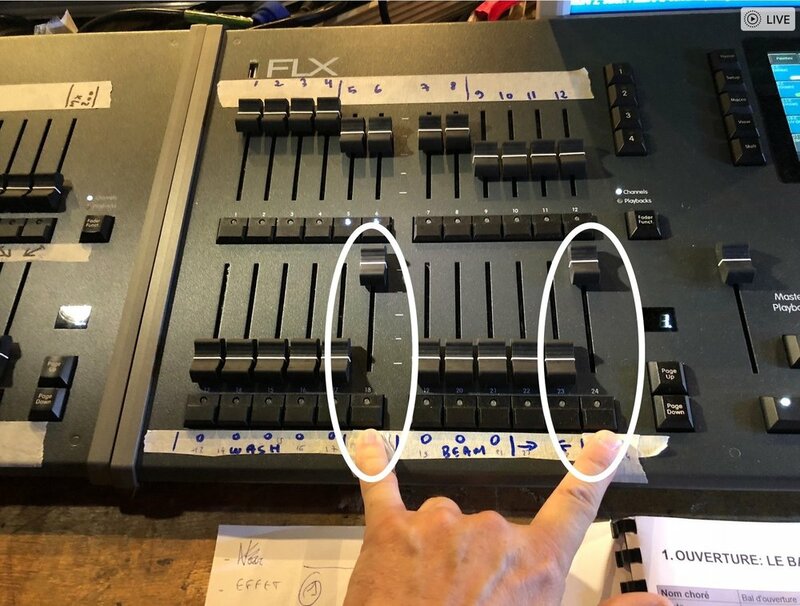 If it happens again, please take a picture of the Output Window and the console's faders. for the MMF fade Do I must dosables this.flnction ? Eric - Edward just wants you to disable this function to try to debug your spurious light problem. Normally it is convenient to leave this setting enabled so when you move a channel MFF the channel is selected. Will there be a new PDF version more current? Chase Speed Option, which I can not find in the Setup menu .... And looking a little in different menus, I can not find. We really should return to the FLX forum for these usage questions. Also it would be good for you to start new topics. This is because we will create a historical reference of knowledge on FLX and other FLX users can both learn and contribute to our collective knowledge. We will not find these answers in this part of the forum after a couple of months. In addition you will find your queries are missed as they are buried with other queries and bug reports -> start separate topics for each query, it's better that way! On a playback programmed with a Chase, SETUP+playback button then Chase page will allow you to select Global Tempo or set a private BPM (beats per minute) tempo for this playback - either type BPM number or tap the MFF button for tempo (maybe button has to be configured for this). For global tempo, the speed can be set by a MFF. SETUP+playback button on an unprogrammed MFF will allow you to set that MFF as the tempo adjust on the fader. These should both be in the current user manual. Regards the manual I think this will only get updated with a major software revision. My personal view is that I agree the FLX manual is quite weak for such a complex product when I compare with other Zero88 manual and other brands. Other users have voiced their concerns back on the FLX forum. You can also use the Orb XF manual, the Knowledgebase and this forum for other support, plus whatever you can glean from the Release Notes. My wish would be that a Jon were more inclined towards the FLX product documentation but I suspect this is one aspect of his job he least enjoys, but conversely he does seem to devote his time to product definition, improvements and furthering the range. Edward does seem quite adept with both his product knowledge and descriptions here on this forum so maybe he might be persuaded to work on the product manual. Having the manual in electronic rather than paper form may be one way to keep the official documentation more in step with the software releases. Anyway enough of my waffle, but I hope that answers some of your queries even if it is only from another users perspective. still a problem during my encoding this Sunday. I understand your problem now. This is due to the sensitivity of “Auto Select Channel on Fader Movement”. This is to be revised in the next software update, to stop this happening. In the meantime if this is causing you problems, you can turn it off by tapping SETUP -> System Settings, and Disable the option. Thanks for your help. I will do it. 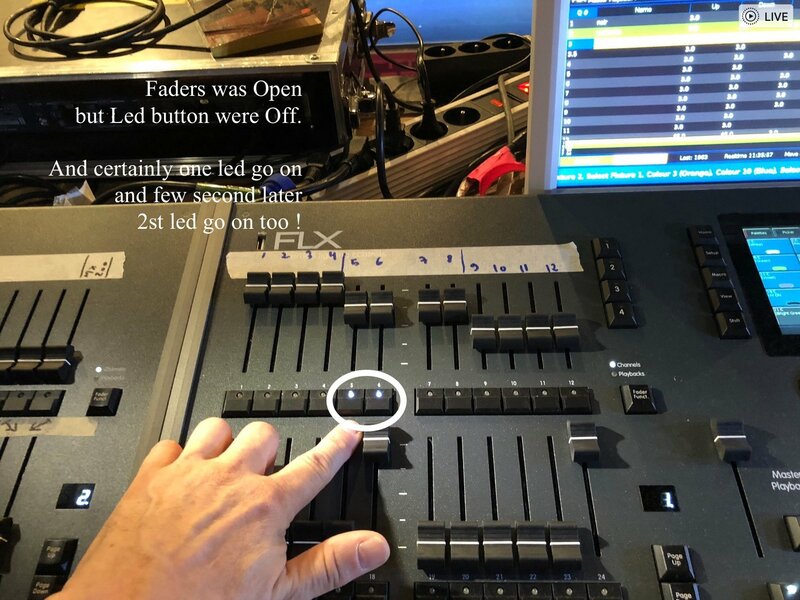 So if I understand correctly it is a great sensitivity of the Faders that makes that from time to time put the LED function of the MMF fader ? That is correct, we are going to adjust the auto select sensitivity. The buttons are used to select the fixture, so that you can control it further. Therefore if you wish to turn this setting off, all you’ll have to do is manually select the fixture you wish to control further- you don’t need to press the button before moving the fader. If fixtures seemed to be randomly turning on, can you remember what colour the fixtures intensity was displayed as in the Output Window? This will help to determine why that might be happening- such as an auto cue for example. Then I expect to buy Capture to continue working with the control room without having installation ... (I asked for a Quote, certainly it is not given for my association, in view of the expenses already made with the FLX + Wings + touch screen, but on the other hand it can allow me to explore further the other functions of your desk. I hope as soon as possible to make videos in French to help and envy future users. Thanks for the help bring! I can really think that there a mystérious gosth on my desk. In 20 days I did 5 performance and Time after Time things go better ! And everytime I can see that this FLX look to be thé right light commander ! thank for this Good production ! This Tuesday was another show. And outside the worries of MMF buttons that are triggered from time to time all alone, (because I prefer for now keep the ON option on the movement of the fader and the setting of the button) for the rest everything works well and gives satisfaction. In fact, when you have the time to program, it's not a problem. (That's what I'll certainly be able to do with Capture) but in the case where the time is lacking it is there to have a few things programmed in addition would be good. - it is for projecteus working in Red Green Blue White Amber. The fact that all 5 colors can not be directly taken into account in color presets makes the FLX try to make amber with RED GREEN BLUE WHITE at best ... MAis misses the amber. And when you go on amber, well then you have to play amber and other colors to find the right tone. The other lack is to have some preprogrammed positions in the automatic. The other big plus would be to have a second video port to be able to have in front of the eyes directly the window of the cues and on the other screen the access to the windows colors, effect, etc ... Gains of time and faster access to be more productive. And finally when having an evolution of the FLX is to have more encoder wheels, as on the Magic Q. And so to access directly certain settings rather than having to scroll the screen. So I love FLX ! It s really a good desk ! -We are planning on improving the Effects engine in the next software update, which bring more useful auto effects. Don't forget to quickly get chases you can use an intensity effect, and use one of the quick offset buttons found along the top of the Effects window. -We are indeed seeing more fixtures using Amber, UV, Lime, Indigo etc. Therefore we are still looking into the best and most accurate way to implement this into the ZerOS colour mixing engine. -Regarding the external monitor, in case you didn't know the shortcut to quickly change the external monitor to your Palettes desktop is SHIFT + VIEW. A single tap of VIEW will then take you back to your Programming desktop.